Yamaha RX-V2067 review | What Hi-Fi? A receiver's never going to be a pretty thing. Still, the Yamaha RX-V2067 is definitely one of the better-looking units in its class, thanks to a minimalist fascia with buttons hidden behind a neat flap. It's available in two finishes, too, the all-black affair seen here, and a rather fetching titanium and black two-tone. Looks are nothing without ability, though. 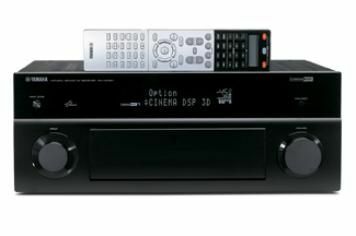 So here are some spec highlights: the '2067 can power a 7.2 speaker package, configurable in a variety of ways, including front height and front width; it has no fewer than eight HDMI inputs and two outputs; it can upscale and upconvert to 1080p; it has an ethernet connection for DLNA streaming, internet radio and firmware updates; it has the most advanced YPAO auto-calibration Yamaha's yet released; and it is, of course, 3D-compatible. Yamaha has also bestowed some rather lovely pop-up menus and graphics on the RX-V2067. Navigating them with the equally impressive full remote (there's also a mini remote in the box) is a simple, fluid affair. There are some sound-enhancing features under the hood, too, many, of which have filtered down from the awesomely impressive £4900 DSP-Z11. And, of course, it's sound that we're most concerned with. Fed the DTS HD Master Audio soundtrack of Where the Wild Things Are the Yamaha responds with a lovely spacious delivery. The dirt clods in the playfight scene swing around the surround field without any gaps, but at the same time the very balanced tonal range ensures that no odd frequencies or sounds stand out where they shouldn't. When compared with a rival such as the Pioneer VSX-LX53, now available for the same price as the Yamaha, the 2067's delivery lacks a little punch and drama. This is something that only becomes more apparent when we switch to Stevie Wonder's Live at Last Blu-ray: the drums fade into the delivery when played through the Yamaha, but drive it on the Pioneer. We're not saying the Yamaha is bad. On the contrary, it's a terrifically enjoyable AV amp, that's great to listen to and live with. It's just that it can't quite reach the sonic heights of the very best in class.